Timothy John Booth (born 4 February 1960) is an English singer, dancer and actor best known as the lead singer from the band James. During 1995, Booth took a break from James and recorded an album with film composer Angelo Badalamenti, entitled Booth and the Bad Angel. He then returned to James to complete the recording of the album Whiplash, and stayed with the band until 2001 when he announced his departure to concentrate on other projects. After leaving James, Booth spent time concentrating on teaching the dance practice known as the 5Rhythms, a movement meditation practice. In 2004, together with record producer Lee Muddy Baker and songwriter KK (Kevin Kerrigan), he released his first solo album, Bone, to general critical acclaim, though he referred to it as a collaborative effort and preferred to credit the album to 'Tim Booth & the Individuals' as opposed to taking sole credit. He also began taking acting lessons during this time, and starred in a production at Bolton's Octagon Theatre. He also appeared as the Batman villain Victor Zsasz in the 2005 film Batman Begins. Booth also voiced the character in the video game adaptation of the film. On Good Friday, 14 April 2006, he appeared as Judas in the Manchester Passion – a musical style show in the middle of Manchester, using music from the region to tell the story of Easter. Booth sang a version of the Smiths's "Heaven Knows I'm Miserable Now", and although the James song "Sit Down" was used, it was not sung by Booth himself (he did, however, sing it in an encore after the cameras had stopped rolling). Booth has also contributed to MTV's search for the greatest song lyrics in April 2006 as a critic. In January 2007, it was announced that Booth would be rejoining James. The band played an eight date tour in April 2007 and made appearances at several music festivals throughout 2007. This was followed by a new James album, Hey Ma in April 2008 which coincided with a UK tour. He has also stated that, despite the reunion of James, he still plans to release further solo material. On 17 April 2010, Booth appeared on Soccer AM and is a fan of Leeds United. In 2010, Booth continued his acting career with a role in the independent film Poor Wee Me, the debut feature from Salford film director Simon Powell, in which he played the role of Gabriel De Souza, the shady boss of a debt collection agency. Booth released a new solo album, Love Life, in April 2011; again with Lee 'Muddy' Baker producing, co-writing and playing guitar. The release of the album was accompanied by a tour of the UK and then Europe, with Tim's backing band featuring Baker as well as Saul Davies, violinist with James. James have annual concerts at Peasholm park in Scarborough. ^ Booth, Tim. "1990 Tour Programme cited at OneOfTheThree.co.uk". Retrieved 29 May 2014. ^ Harvey, Ian. "Hey ma, James are back in town". Express And Star. Retrieved 29 May 2014. ^ "Oneofthethree.co.uk". Oneofthethree.co.uk. 25 April 2008. Retrieved 27 February 2014. 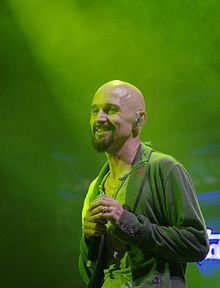 ^ "Tim Booth". Poor Wee Me. Archived from the original on 8 March 2012. Retrieved 4 May 2012. This page was last edited on 13 February 2019, at 22:00 (UTC).